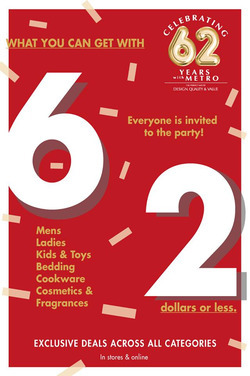 Metro Singapore carries apparel and accessories, bedding, and cosmetics. There's something for every one in the family. Check out any of the 5 Metro stores in Singapore. Be a Metro member and enjoy a 10% discount all year round and 20% discount on your birthday month. Shop Metro online and enjoy free delivery when you spend $80 and above. Metro was started by Ong Tjoe Kim in 1957. Follow Metro on Facebook to stay updated about the latest deals and promotions. Do you want to receive more offers from Metro by email?